Letters from popes, archbishops and theologians were an important category of writing in the middle ages. 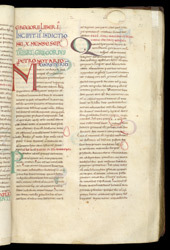 The Registrum or letter-book of Gregory I (the Great; pope 590-604) survives in many copies made during the middle ages. Gregory's correspondence was especially important to English churchmen because he was the pope who sent Augustine on his mission to convert the Angles. This copy of Gregory's letter-book was probably at Rochester cathedral priory from the 12th-century. The church of St Andrew, Rochester, was founded in the earliest days of Augustine's mission. The letters would have been read as historical and legal records, source material for sermons and theological commentaries and probably for personal study and contemplation. This page has letters written in September 590, to a range of recipients, including ordiinary people (plebs), a notary and a bishop. The manuscript was made as a book to read not to show off. The vellum has several holes in it, and the rubricator (who 'rubricated' or wrote the red titles) encircled them to alert scribes and readers so they could avoid writing on the next page or misreading letters from it.